Stuck in a myth that getting rid of those extra pounds from your body weight is all about dieting? In reality, this is not completely the case. Though trying to control what you eat helps a bit but it is the healthier lifestyle that matters the most. If you really want to see yourself losing weight without struggling with short-term fad diets, then stick to the healthy regimen and you will lose weight naturally. Living on those calorie cutting fancy diets is never realistic or sustainable. It’s all about what’s your portion size. Be careful in choosing the quantity. Most people end up having more than their stomach requires. Take on this big challenge to put a bar on your portion size and results will follow up naturally. It’s a secret recipe for losing weight without putting yourself on medications. Start with small portions of food and keep the pace slower, so that you minimize the chances of overeating to the lowest. How about starting your meal with salads? Loaded with lots of fiber, they give you a feeling of fulfilling before you crash down due to overeating. Eating too much sugar not only faints you later but also takes a serious toll on your health. You might have seen sugar lovers ending up with type 2 diabetes and heart diseases. The high sugar intake also puts the dream of losing weight on the back-burner. So, beware! Watch out how much sweet poison you are consuming every day. 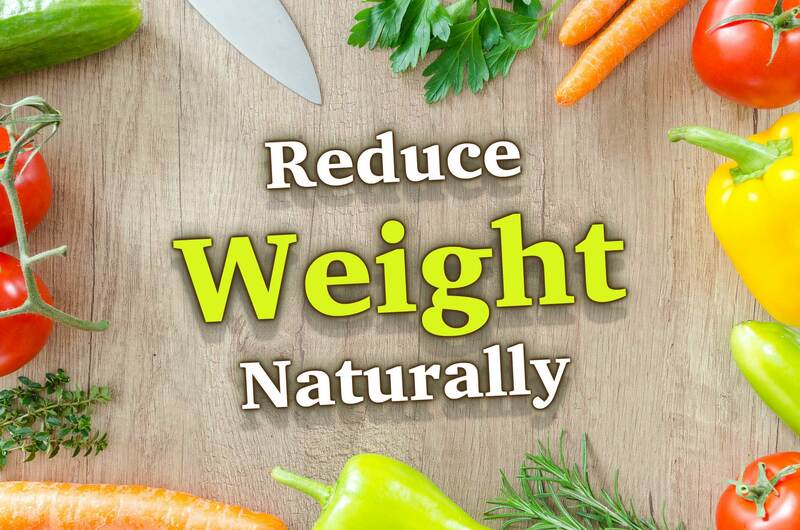 Reducing your sugar intake will invite weight-loss naturally. Think that skipping meals, especially the breakfast could help you lose weight easily? Unfortunately, this is not true. In fact, starving yourself from the meals is a bad idea that leads to a buildup of fat cells. Putting yourself in starvation mode increases the risk of weight gain. Instead of erasing main meals from your diet plan, try to eat in small quantities, 4-5 times in a day to boost your metabolism and keep your energy levels up. Feeding at the right time in small portions also reduces the risk of accumulation of fat cells and keeps you in auto mode to shed off those extra pounds naturally. Water helps cut down the hunger feeling. In other words, the more hydrated you stay throughout the day, the fewer cravings you will have for food. Sometimes even your mind mix thirst with hunger. Stay hydrated to avoid misinterpreting those signals as a need for food that helps you lose weight without asking for it. Who minds having those tasty sandwiches filled with mayonnaise and cheese? But then comes the price with it that you pay by adding more pounds to your weight with each bite of it. Not worth, right? Better use healthy fillings such as legumes and salads rich in fiber to make it a calorie cutter. You will love its aftereffects on your body weight. Haven’t taken an early morning walk for years? Never spared some time to shed some sweat for the health sake? You are ruining your health by adding a big bank of calories that you will repay later with obesity and deadly diseases. It’s never too late to indulge in physical activities. No one is asking you to join a gym. Even a simple 30 minutes of jogging a day could do the magic and shed those extra pounds naturally which ruin your health and personality. Getting rid of extra weights is possible if you don’t neglect basic things your grandma has told you once. Drink plenty of water that never costs you a fortune. Kicking extra pounds out of life is easier than you think. Don’t emphasize on starving yourself because you end up losing your health. Remember, losing weight is a by-product of following a healthy lifestyle. You don’t have to impose intense workouts on yourself that drain you out of energy. Simply following these crucial tips could help you get rid of extra pounds that cause nuisance in life. Meet the freelance writer who is always in kitchen penning down his knowledge into engaging blog posts while enjoying the culinary delights. His unconditional love for food and technology has not only nurtured him into a passionate writer but also has an effect on his tummy. He can be reached on LinkedIn anytime.